Day1: Arrive at Entebbe International Airport- Pick up and drop off at Hotel. BB. Our tour representative will collect you from the airport, brief you about this tour and head to your hotel in Kampala or even Entebbe. Dine and slumber at your hotel. 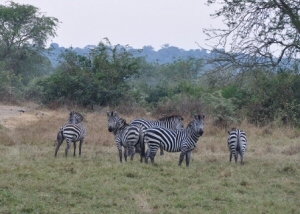 After an early breakfast, Your guide will pick you from the hotel and drive you to Murchison Falls National Park. this drive will take you through Kawempe and Luwero or through Hoima road. You will have a stopover at Ziwa Rhino Sanctuary to track Rhinoes. 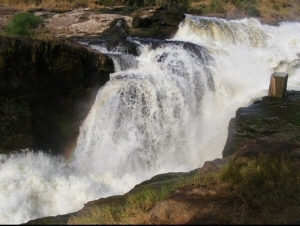 After your lunch you will continue to the top of the beautiful Murchison falls and there you can take pictures of the grat nile exploding through a small 7 meter gorge and thunderous drop to over 43 meters below. 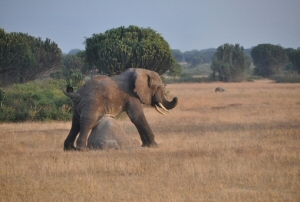 After an early hot cup of tea / coffee leave for an early morning game drive looking for the early morning riser. You will look for buffaloes, oribi, elephants, hyena, Rothschild giraffes, lions, Kobs and waterbucks together with birds. Head back and rest at the lodge till lunch time. In the afternoon have a Boat ride along the Victoria Nile to the base of the falls. This Boat ride on River Nile goes for 3 hours and you will be able to see Nile crocodiles, numerous hippos, buffaloes, elephants as well as various bird species. Return for dinner and the overnight at the lodge. After your breakfast, proceed to the park headquarters of Kibale National for briefing regarding chimpanzee tracking and from there you will head into the forest and begin searching for the chimpanzees. As you look for the chimpanzees, you’ll see various primates such as black &white colobus monkeys plus the L’hotst. 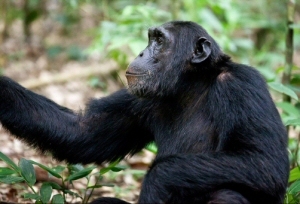 Observe the chimpanzees jump from one branch to another as they pick different fruits. Head back to the lodge for your lunch and later have a walk in the swamp to see other primates plus bird species. Dine and slumber at your lodge. Following breakfast head out with a packed lunch, head to the park headquarters where you will be briefed by park ranger regarding the gorilla tracking. Head into the forest and begin searching for the gorillas beginning where they were previous seen the day before. When you finally find them, you will be allowed to stay with them for only an hour observing them play, feed and cater for each other. 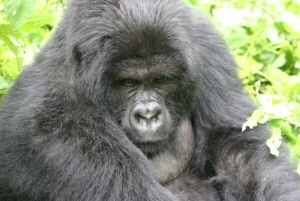 Gorilla trekking may take 2 to 8 hours basing on the weather. Dine and slumber at your lodge. Budget accommodation: Muhabura Lodge / Kinigi guest house. After breakfast, go to the ORTPN to be briefed about gorilla tracking. The Mountain Gorillas are among the endangered prehistorically mammal species which are presently seen in Uganda, Congo as well as Rwanda. They stay in families each with a dominant male referred to as silver back. 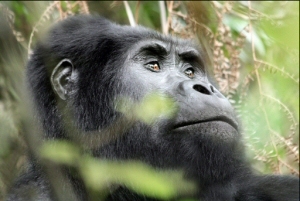 At the present time, they are estimated to be 720 mountain gorillas in the whole world. Your guide will guide you into the verdant forest to start the search. You’re recommended to put on hiking shoes plus long trousers since the forest is usually wet and there could be some biting insects. The total time it will take before you see the gorillas is unpredictable therefore your patience is needed. This search takes Two to eight hours. When you finally meet them, you’ll be filled with pleasure to the extent of not remembering the tiresome journey. You will spend one hour with them, take photographs and observe the young ones play while others feed. Following the tracking, you will visit the two twin lakes Bulera plus Ruhundo. Dine and slumber at your lodge. After breakfast drive to Kampala, with a game drive on the way, stop by the equator and take some pictures and then proceed to Kampala where you will be transferred to the airport for your departure flight.